PLETTENBERG BAY NEWS - Not only will Plettenberg Bay see bigger aircraft land in the town in future, but the growing local airport is also poised to receive an investment of more than R4.5-million during the current financial year. 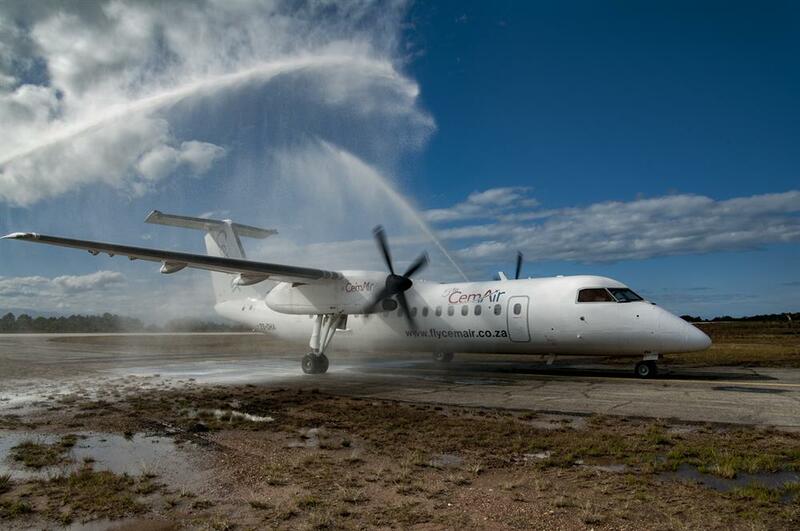 Aircraft owner and operator CemAir on Tuesday, July 26 launched a new and larger plane at the Plettenberg Bay Airport. The aircraft – a Dash-8 Q300 – will be used to fly visitors between Plett, Cape Town and Johannesburg during peak season. CemAir chief financial officer Laura van der Molen said the new aircraft was a larger variant of its current Dash-8 100 being used on the routes but with passenger seating increased from 37 to 52 seats. “The aircraft is a twin turboprop and was chosen specifically for its impressive short runway performance. It will definitely be a good fit for airports like Plettenberg Bay with shorter runways,” Van der Molen said. She added the "Q" designation in Q300 was from the manufacturer’s inclusion of noise dampening technologies, giving it jet levels of cabin noise with turboprop efficiencies and field performance. With the launch of the larger aircraft Van der Molen also announced that because of the growing popularity of the two routes – especially with recently established year-round events drawing people to Plett out of season – that CemAir planned on introducing more frequent trips between the destinations. The Plett to Cape Town route currently runs three days per week, but from October will see daily flights. There are also currently six flights a week between Plett and Johannesburg, but this will also extend to daily flights come October. Since the launch of the flights between the popular holiday destination and the two major city centres two years ago, it has gone from strength to strength. Within the first year 9 000 passengers made use of the service, which equated to an estimated R56-million boost to the local economy. “And we have definitely seen an uptick from last year,” Van der Molen added. It is therefore that the Bitou municipality has since invested substantially in the airport and its operations, and mayor Memory Booysen at the launch announced that R4.65-million will be invested during the current financial year. This will include the establishment of a satellite fire station to the tune of R650 000. It will also include paving, fencing, roadways and additional parking for aircraft set to cost R1.3-million, and terminal building improvements of R2.7-million. Last year the municipality spent R1.3-million on resealing of the airport apron, resealing of turning circles on the runway, mast lighting, a water tank and clearing of alien vegetation. He also said there were plans in the pipeline to ensure that the success of the airport spills over into surrounding areas including Knysna. Among the activities during the launch of the bigger aircraft included several underprivileged members of the Bitou community being given the opportunity to see their town and surrounds from a different angle. About 100 people, including some of the town’s elderly and high school pupils, were taken for a 20-minute trip over Robberg towards Keurbooms, over Plettenberg Bay and towards Knysna – where they could see the famous lagoon and the Heads – before heading back to the airport. For most it was the first time ever in an aircraft. Some of the passengers were so chuffed that they spontaneously broke out in song along the way.